The planet Neptune shines a serene blue in this image assembled from two photos by NASA's Voyager 2 probe during its historic flyby of the planet in August 1989. Neptune reaches an orbital milestone called opposition in the night sky on Aug. 29, 2014. Armchair astronomers can enjoy a cosmic double play tonight (Aug. 29), with back-to-back webcasts featuring faraway Neptune and a close-flying asteroid. The action starts at 8 p.m. EDT (midnight GMT Aug. 30), when the online Slooh Community Observatory will air a live four-hour show to mark an alignment of Neptune, Earth and the sun. Once that webcast ends at midnight EDT (0400 GMT), Slooh will cover the flyby of near-Earth asteroid 2002 CU11, nicknamed "Dodgeball" because of its frequent close approaches to Earth. The webcasts, which will both feature views from a telescope in the Canary Islands off the west coast of Africa, are also available at Slooh's website, www.slooh.com. Neptune is about 17 times more massive than Earth and shares with our planet a deep blue color — but for different reasons. ‪"In our case, the color comes from a combo-plate: Our oceans absorb red light and reflect away the blue, plus our atmosphere scatters blue light," Slooh astronomer Bob Berman said in a statement. 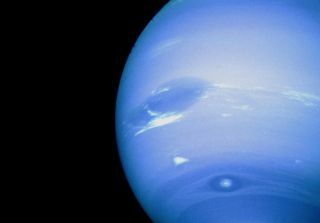 "But Neptune's color is due to methane, what we on Earth call natural gas. It absorbs the sun's red light but bounces the blue back to our eyes," Berman added. "The result is arguably the most deeply colored planet in the solar system, and the only one that always requires a telescope, since Neptune alone is never visible to the naked eye." Backyard astronomers with a telescope can spot Neptune in the constellation Aquarius tonight, to the left of the star Sigma Aquarii. Neptune will look like a dim blue star, and it will be highest in the sky between 10 p.m. and 2 a.m. local time, Slooh representatives said. The second show focuses on the 2,400-foot-wide (730 meters) asteroid 2002 CU11, which will fly by Earth tonight at a distance of 13.2 million miles (21.2 million kilometers), or about 13.5 times the distance between Earth and the moon. There is no chance that "Dodgeball" will hit Earth on this pass, and orbit calculations show that the asteroid poses no danger for the foreseeable future. If 2002 CU11 ever did hit the planet, however, the results would be dramatic. The collision would unleash as much energy as 53,000 megatons of TNT, Slooh representatives said, making it about 3.3 million times more powerful than the atomic bomb the United States dropped on the Japanese city of Hiroshima during World War II. The asteroid 2002 CU11 completes one lap around the sun once every 492 days and has an odd orbit that carries it about 48 degrees above the plane of the solar system, according to Slooh representatives. Editor's Note: If you snap a telescope photo of Neptune, asteroid 2012 CU11 or any other night sky target, and you want to share it with Space.com for a possible story or image gallery, please contact managing editor Tariq Malik at spacephotos@space.com.